My main goal is to build a portfolio of $1,000,000 in 1500 days with no debt*, starting from 1/1/2013. Every month, I provide an update on my status. 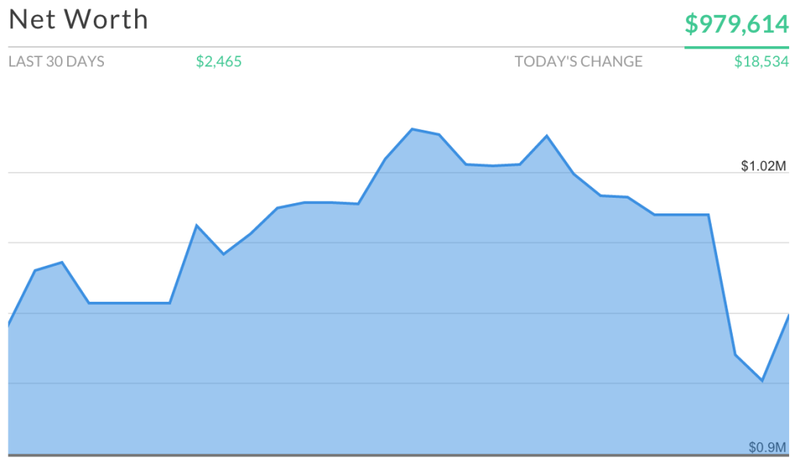 My goal for 2015 was to get my portfolio up to $874,353. Because we saw exceptional returns in 2013 and 2014, I have already accomplished this. Let’s have a look at September. In July, my portfolio peaked at $1,070,000. And it’s been tanking ever since. I closed August out at $992,150 and September at $979,614. I couldn’t care less. To learn why, we must consult the brilliant Charlie Munger. Risk to us is 1) the risk of permanent loss of capital, or 2) the risk of inadequate return. 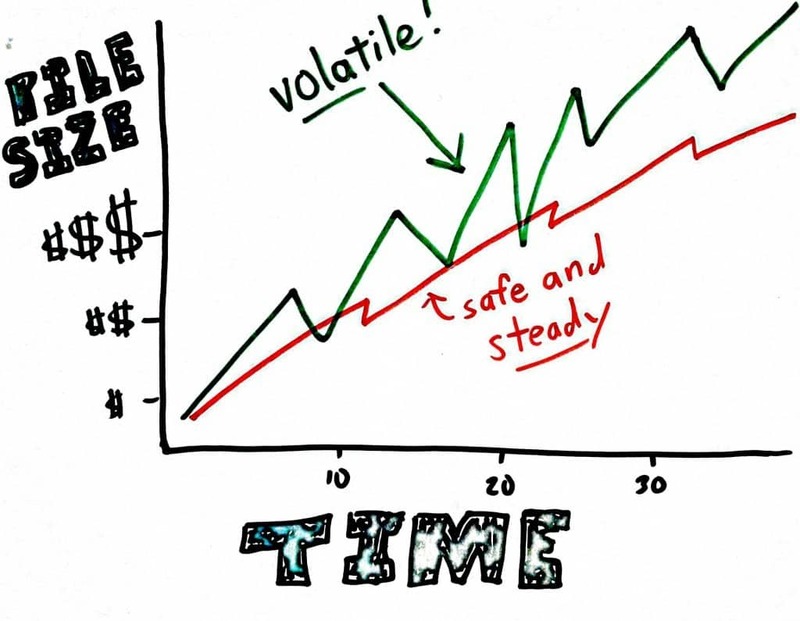 Volatility is an overworked concept. You shouldn’t be imprisoned by volatility. And I completely agree. Munger’s two thoughts have one thing in common; they both speak to a long term mindset. I care about exactly one thing and here it is. Ready? Over the long term, I want my pile to be as big as possible. I don’t care about where my investments will be in 3 months, 6 months, 1 year or even 5 years. I won’t access the majority of my investments for decades, so I care about the size of the money pile in 20 or 30 years from now. Drops of 1,000 points won’t mean much at all in a couple decades. I doubt I’ll even remember them. One problem I see with investors is behaving too conservatively. If you’re young and concentrate on investments that preserve capital or favor income over growth, you may be sacrificing long term returns. I don’t care about charts. I ignore hot stock tips. Fancy cars and $100 jeans don’t make me smile. It’s that in the end, I have a very large pile. I’ll bet you didn’t see that one coming, did you? Please stick around, I promise I won’t write anything like that again for at least another week. Thanks Personal Capital** for the chart! Did you notice my day count? As of 9/30, I’m at day 1002 out of 1500! Where has the time gone? If anything is a wake up call to get on with my life, it’s numbers like this. This sounds cliché and trite, but it really does seem like January of 2013 was weeks ago, not close to three years. Now, I’ve had about 1,200,000 views and the journey has been incredible. I’m not the same person I was when I started. I’ve met some great friends and learned so much. Life is great. Thanks everyone! **This is an affiliate link. If you sign up, the blog makes a little bit of money. Personal Capital is a totally free and superior way to keep watch over your investments. It’s worth it for the fee analyzer alone. I would never recommend anything that I don’t personally use and completely believe in, so give it a try. If you’ve already signed up through the link, please know that I am thankful and absolutely think the world of you. When you stop by for a visit, I’ll let you try out my sweet new skateboard and you can even have a zipline ride (coming summer 2016). Coming next month: Broken arm! Skateboard! Some dudes go out and buy a Corvette or motorcycle to assuage their midlife crisis. 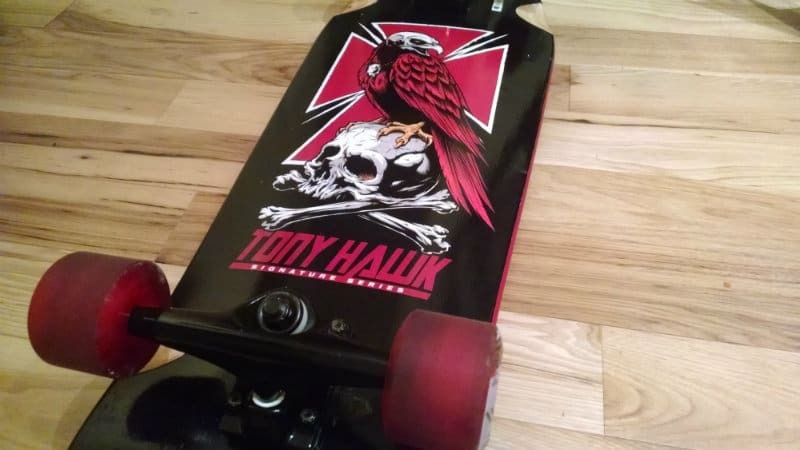 I went on Amazon and bought this crappy skateboard for $60. The neighbors already think I’m crazy. Seeing a 41 year old dude cruising down the street on this thing will help cement their opinions. Life is wonderful when you truly don’t care what people think. Love the poem! I may grumble a little at seeing my network go down, but then I move on to the spreadsheet where I track how many units I purchase each month and I’m happy again. Stock market is down, I get more for my money. That’s a good thing, right? NETWORTH. Not network. It’s too early in the morning. That is an awesome troll quote! You do not like Green Eggs and Ham?! Nice poem 1500s. Another great quote that fits in with the theme of this post, “We don’t give a damn about lumpy results”. In fact to hear Buffett and Munger talk, they PREFER them! Yeah, lumps are present buying opportunities. Bring them on! I love your Dr. Seuss-like poem. And your skateboard rocks. I really want a long board from this local company, Salem Board Company. They’re kind of pricey, but they employ local kids in their shop. Pretty cool, huh? I want a longboard too, but one skateboard/year is enough. Maybe next year? Interesting thoughts on portfolio allocation. We’ve been trying to calculate portfolio risk when you begin to include real estate (rental), it becomes sort of difficult because RE isn’t nearly as well studied as the stock market. The thing about RE though is that it’s more in your control. If you’ve studied, you should know what kind of rent you’ll get. You’ll also know the condition of the home (pay attention to roof, mechanicals). It’s then up to you to get good tenants. Screen the &#%* out of them! You’re a Poet! Grow pile, grow! So, I have a query. How does the now gainfully employed Mrs. 1500 impact your plans? Isn’t the $1m for both of you to live off of? Could you live off her income and let your portfolio ride the wave for a while without tapping into it? Mrs. 1500 working changes everything. She makes enough for us to live on. So, if I quit today, we wouldn’t have to touch our investments. It is a HUGE weight off of my shoulders. I look forward to reading about your broken arm! The poem is awesome. One question though, you listed your 401K contributions YTD for 2015 as $36,925. How is that possible when the contribution limit is $18K. Even if it was for both of you and Mrs. 1500, that is still an extra $925 over the limit. I may plagiarize your at my next poetry slam. **I may plagiarize your poem at my next poetry slam. That’s what I get for not proofreading before posting. I ruined my own joke. Regarding the 401k, I work in a corp-to-corp situation, so I’m including my corporation’s matching contributions. So, the Mrs. and I each do 18K as you’ve already figured out. Tax law allows a corporation to match up to 25% of wages. Mrs. 1500 will bring in $25,000 and I’ll bring in $50,000 in wages. So, the total contributions for the year will be $54,750 glorious, pre-tax dollars. Never heard of corp to corp before. Very interesting. So you have incorporated yourself as a contract worker? Therefore you can determine how much you decide to company match? Don’t break your arm, think of the medical bills. Will there be a Mr.1500 coffee table poem book in the future? Version 2.0 baby. You want in? I guess the good part about being so far away from FI is that my contributions outpace the market gains (I mean losses) of late. I hope this isn’t the case in the near future as I want my pile to grow, baby grow as well! P.S. – That skateboard is so rad! You’re a Poet? And I didn’t even know-it! Speaking of dumb trolls, you should also watch out for other bloggers who try to post hateful messages on your site due to envy/jealousy. Good luck on your FI journey Mr1500 Days! I’m sorry you’ve experienced that DGI. I’ve had some of that too, but it’s been a while. Just remember trolls/hate mail are a sign of success! If you weren’t successful, trolls wouldn’t bother! Still, I don’t know how people like MMM deal with it. “Life is wonderful when you truly don’t care what people think.” This is for me a great quote. I consider it the best definition for FI…! The skateboard is a great way to deal with a midlife… I feel mine is coming too… a motorcycle will get me into trouble with my mother and wife, but a skateboard…! It is great not to care! Being FI makes it easier too. Less stress because of less dependencies on others. I can just be my strange self! Those are some amazing results for September. With only 498 days left, can you see the time line cut short before 1500 days? Meaning to heck with waiting until then, retire ASAP. Loved the Dr. Seuss inspired creativity! I see where you’re going with that rhyme Bryan and I like it! But yes, best left alone! Looks like almost everyone’s net worth has been dropped and they including myself and you care less about net worth drop. The reason is simple. We know time is on our side and as long as we keep save and invest wisely, the net worth will easily grow like there is no tomorrow. Thanks for sharing. I always enjoy your article. The market has offered some pretty good deals recently, but you’re right – it takes some guts to jump in. Oil has been hit hard over the last 10 months or so and other basic materials and commodities for the last few years, but if you truly have a long term mindset, there are some great deals to be had on companies that will be around a long time. Patience and the right mindset will be all you need! Wow, never knew you were so poetic! Same as with you guys, our networth got hit too, but due to our real estate holdings the impact was rather limited considering the current stock market’s correction. Great time to buy though! I really enjoy your site and we have a similar sense of humor…. I track my ‘total account balance’ monthly too and am ahead of my goal – yay! I feel that since I am still accumulating and loading up on equities, the down market is just buying things on sale. I hope that I will still feel the same when I am not accumulating…. I guess I missed the troll, is its pile of poop still around or did it get cleaned up? Ever thought about adding the total average annualized return to your goal tracker page? Might be nice as a kpi for your portfolio strategy. That is a good thought. I’m a numbers fanatic, but it takes time to keep up with all of that. Good news is that I’m going part-time in 4 short weeks, so perhaps then. Do you have any good suggestions for a tool that could do that? I don’t think Personal Capital can.